I am having an issue with my 2006 4.4i the driver side headlight lowbeam stopped working after I unplugged the headlights to take them out to clean. I have been trying to diagnose the problem for the past week and just can't seem to pinpoint what exactly it is. I can get the headlight to turn on on initial start after unplugging the battery or if I unplug the passenger side headlight assembly. Also the follow me home lights work with no issue both lowbeams turn on every time without fail. I have tested and swapped bulbs and ballasts and the headlight switch everything seems to be working and the problem remains on the driver side. Any help or assistance is apreciated. #5 in the diagram below) that can cause intermittent lighting issues like you describe. If you have diagnostic equipment (software/hardware)...you'd see some indication of faults with the ALC module. I think it (ALC) stands for either automatic or adaptive light module. If you don't have any way to diagnose or communcate with the vehicle...you can try swapping this module to see if the problem follows it to the other side. Last edited by Qsilver7; 08-22-2015 at 01:34 PM. Thanks for the reposne. I checked the ALC module that is fine. I swapped it out with a new one and still have the same issue. And do yoy mean #5 in the diagram below because I did not see a number 35? Yes...I meant #5...please excuse my BT keyboard...I try to catch the mistakes it makes...but sometimes I miss them. In this case I guess the SHIFT key didn't line up with the 3 key...so "#5" turned into "35". I'll go back to correct the typo. Ok so what is the part name for #5 and what does it do? #5 is the ALC module...which you indicated you already checked. 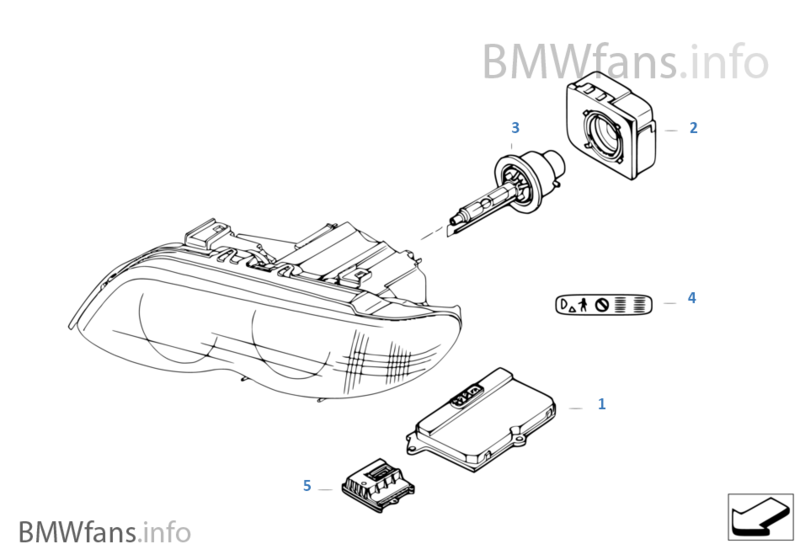 The link at the top of the diagram in my post above will take you directly to the part number index that gives the offical name (or at least what BMW calls it in the part number index). And a simple google search using "BMW ALC issue" as the search phrase should bring up various threads were other bmw owers have discussed this issue...and probably across multiple models since adaptive HID lights are used across multiple BMW models...which adds more owners to the collective on this technology and issues/problems...the technology works the same across all BMW platforms. So this should bring common issues and solutions. Last edited by Qsilver7; 11-08-2015 at 01:40 PM. And a simple google search using "BMW ALC issue" as the search phrase should brig up various threads were other bw owers have discussed this issue...and prbaby across multiple modules since adaptive HID lights are used across multiple BMW models...which adds more owners to the collective on this technology and issues/problems...the technology works thhe same across all BMW platforms. So this should bring common issues and solutions. I just dealt with this on my 4.8is. Total pain. I finally fixed it though. The only way is with DIS/GT1. Do you have a computer with this or access to one? Most likely you lost the ground for that side of the low beam headlight. Here's a video on why no low beam on the car and the solution. If you find Eric's video helpful, please like his video and subscribe to his channel. I recently went through this exact same scenario with an '06 3.0i. It turned out to be a faulty LCM and ALC. Both had to be replaced. The LCM has to be coded, but the ALC is plug and play.